We all know getting your dog dry after a wash can be an ordeal. Many dogs run away as fast as they can once they have been doused with water, leaving a trail of suds, droplets and wet fur all over the house. A good dryer will leave your dog looking and feeling great. Of course, different dryers suit different needs and the aim of this article is to help you find the best high velocity dryer for dog grooming that fits your budget and your dog’s fur. It may seem a bit odd to invest in a hair dryer especially for your pet, when you’ve probably got a perfectly functional hair dryer at home! But I promise, there are many reasons why a specialized dog hair dryer is worth the spend. We have put together a list of the best hair dryers for dogs. While we are going to be focusing mainly on high velocity dryers, we will also highlight our pick of the best hand held dryers, and dryers which are mounted on stands. 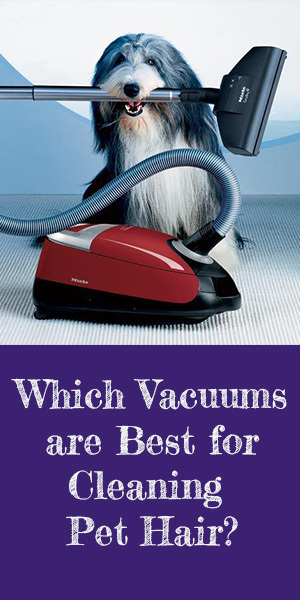 Read on to find out which is best high velocity dryer for you and your dog. What is a dog “hair dryer” exactly? 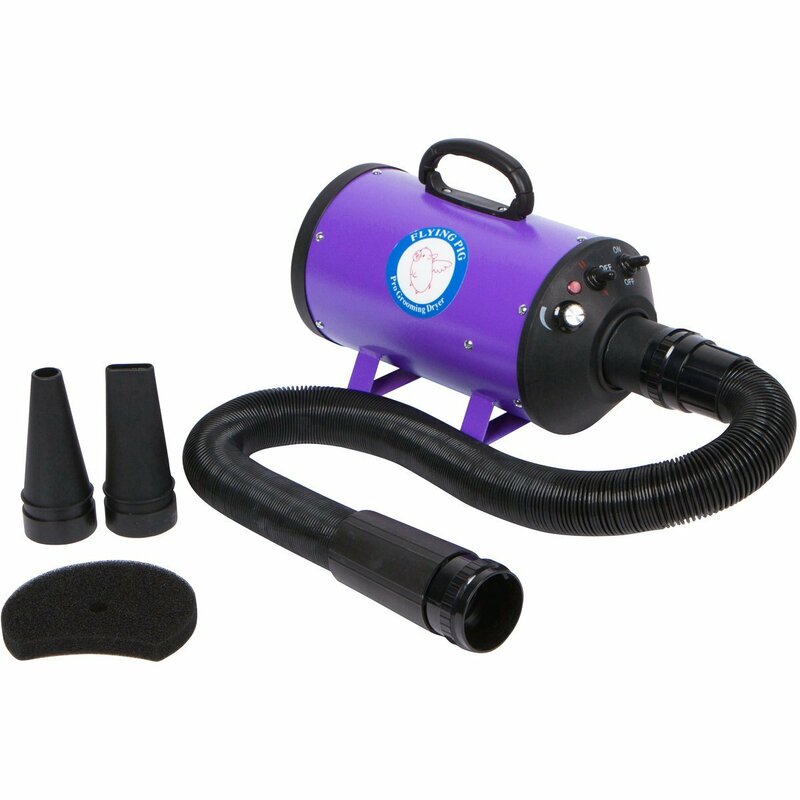 Dog hair dryers are designed to safely and effectively remove water and moisture from the dog’s coat. Because dogs often have thick, multi-layered coats, they need extra power and air force to penetrate the thick fur. 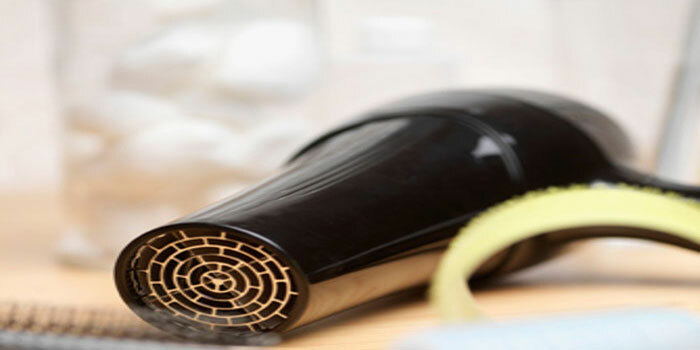 While most human hair dryers get very hot, most dog hair dryers do not reach a high heat. It is not safe to apply heat directly to a dog as it can cause overheating and severe discomfort. Dog hair dryers don’t actually “dry” the fur, in terms of applying high heat. Instead, air pressure removes the moisture from the fur by force. The strong air-flow doesn’t harm the dog, it’s just strong enough to get through the thick layers of fur, and down to the skin. As mentioned before, while many dog hair dryers have different heat settings, the heat rarely goes beyond 70 degrees Celsius. You can even opt for no heat at all, which is handy for warm months and sensitive dog skin. What kinds of dryer are there and how do you use them? 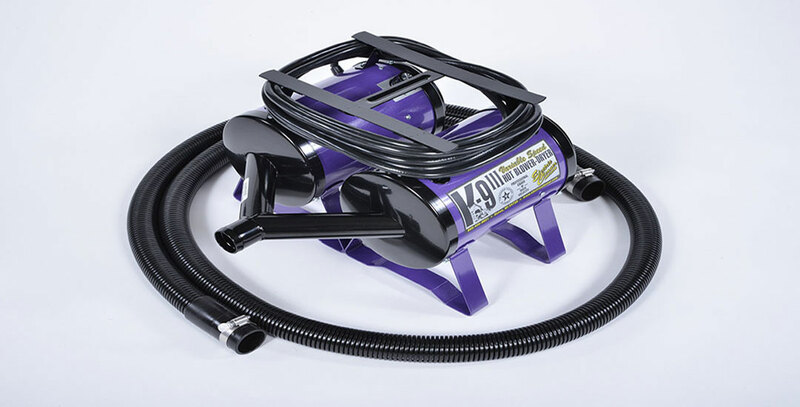 High velocity dryers are used by manually holding the hose, while the motor stays put on a surface. You can manually dry the dog by directing the hose, and controlling where the air flow goes, (keeping it away from eyes and ears). These dryers have a powerful air flow and speed. Stand dryers are mounted on a stand, and are set up to be above or facing the dog, and can be moved and altered throughout the drying process. The dog stands under or in front of the dryer and is dried with a steady flow of air, instead of being dried manually with the owner directing the hose, (although, some stand dryers do have a hose option for manual drying). These types of dryers are often used by professional groomers as they can stand above the dog on a grooming table and it leaves the groomer’s hands free for brushing and clipping. Why buy a hair dryer specially for your dog? 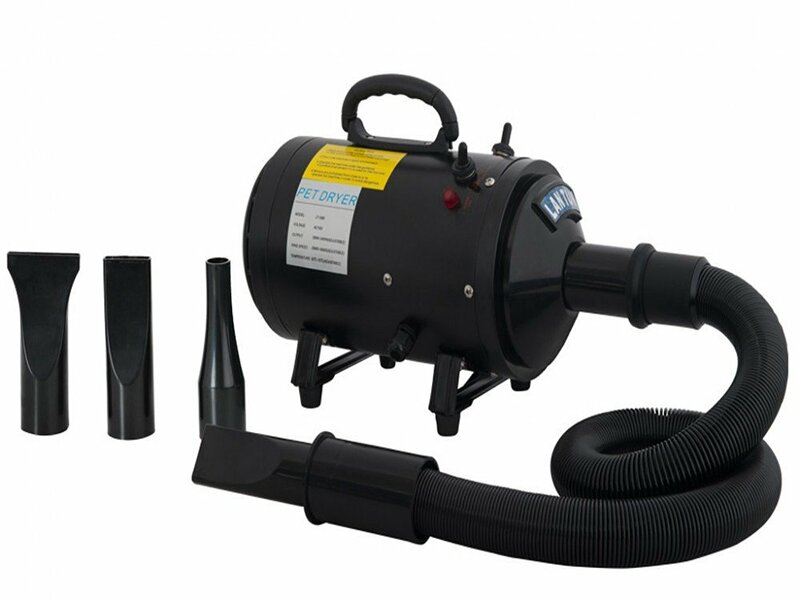 The air pressure blows away any loose particles. So, using a dryer on your dog after washing is a great way of reducing pet hair deposits on your floors, clothes and furniture and keeping dander at bay. Keeping the dog’s skin and coat dry after washing is also a good way of preserving the grooming and brushing you have done, as dry fur is less likely to become matted and have dirt and particles stuck to it – which is more likely to happen if the dog goes adventuring while he is still wet. Dogs with fluffy, delicate fur benefit from a proper blow dry because it allows the fur to maintain a groomed, tidy appearance. Making sure your dog is dry after a wash is also great for you, as it prevents streaks of water and dog fur being strewn over your home. Material – Plastic hoses which are subject to warm air can sometimes be prone to breaking or warping. Make sure the model you select has a durable hose, models with this feature will always state this on the specifications list. Build Quality – If you are opting for a high-velocity dryer with a stationary motor and hose, then make sure the body of the machine (the casing around the motor) is strong and protective. The longer the motor lasts, the better, and a protective casing will ensure this. Hose length – If your dog is large, look for a model with a long hose, so you can easily move around the dog and get into all the tricky places. Variable Speed – Dryers with variable speeds are great because you can change the speed/pressure according to the delicateness of the part of your dog you are drying. You will want to take the speed down when drying the dog’s face or around any sensitive parts. Here is our pick of the best high velocity dog grooming dryers on the market, with a rundown of the key features. This dryer has been designed to suit sensitive and skittish dogs, as it features low-noise technology. This model comes with different attachments which allow you to get deeper into the fur for maximum drying. This a real all-rounder, and is suitable for dogs of many sizes. You can dry smaller, more delicate dogs with the lower speed setting, and sturdier dogs with the higher one. There are also 2 temperature settings, which are between 30 and 70 degrees Celsius. This yellow and black dryer packs more of a punch than the previous model mentioned, as it offers 2800W of power. The strong power is ideal for big dogs with thick, layered fur. The attachments are handy as you can switch them around according to which dog, and which areas need to be dried. This model is louder than others, which might be a no-no for certain dogs. But if your dog tends to be unfazed by noise then it will be fine. Most dogs will get used to the sound after a while. The different air flow and temperature settings gives you the option of adjusting the drying settings to suit your dog. The dryer has a safety cut out to prevent overheating and some users who use it for prolonged periods of time find it cuts out sooner than they’d like. But for most regular users this should be fine. This is a very comprehensive, powerfuldryer (which of course is reflected in the price).As you’d expect, dogs with very thick hair tend to retain more of the moisture and are harder to dry. 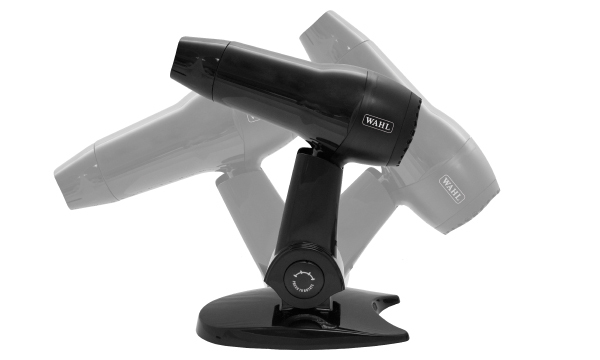 But even the thickest hair is no match for this dryer, as the high-powered air flow gets right down to skin level. There are two speeds available, to suit different types of dogs and coats. The force of the air flow is probably best kept away from dog’s faces and ears as it’s very strong and your dog might not appreciate a heavy gust of air being blown into his eyes! But it’s ideal for bodies and less sensitive areas. The high price-point of this product might be a bit much for every day, home use, but it’s a good choice for professional groomers, or owners with several dogs. 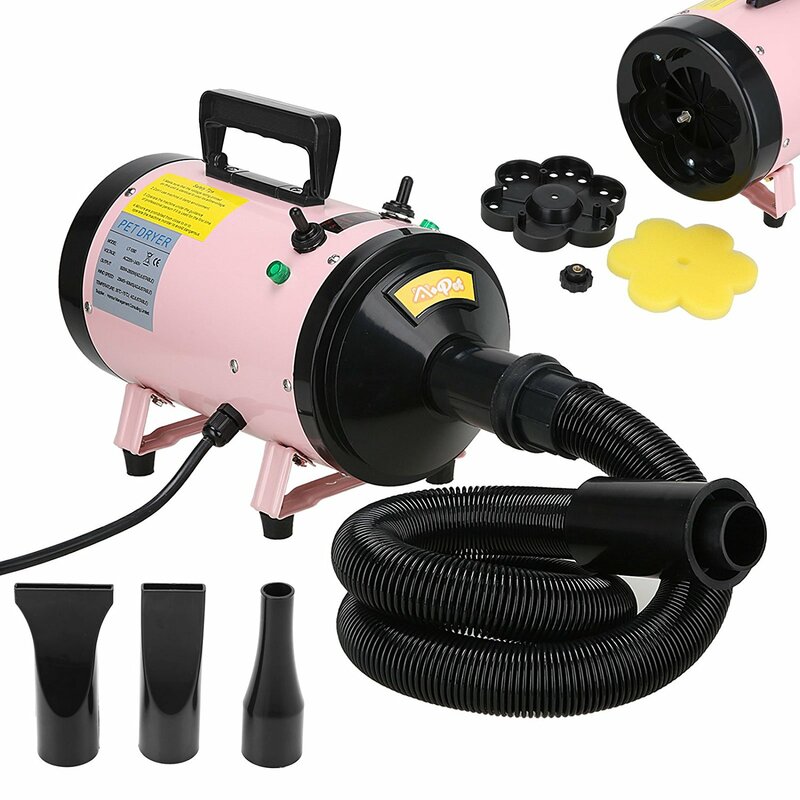 This pretty, pink pet dryer from Voilamart has a whole lot of great features for its low price-point. The noise-muffling technology, plus the silencing cover keeps this dryer at a low hum, which won’t bother or scare your pet. The hose is a generous 2.5M which means you have a wider working space. The 3 extra nozzles provided are different shapes and sizes, so you can swap them around according to the thickness of the fur, and the area of the dog you are trying to dry. This is a good choice for anyone who wants the sturdiness and versatility of a high-quality dryer, without breaking the bank. The hose is a whopping 10feet, so you have quite a lot of flexibility and movement when drying large dogs. The long hose also allows the air temperature to be bought closer to room temperature during the long journey from the motor and out the tip. The hose is strong and break-proof as any good dog dryer hose should be. The motor is encased inside a very strong metal outer frame, which is great for the longevity and durability of this model. 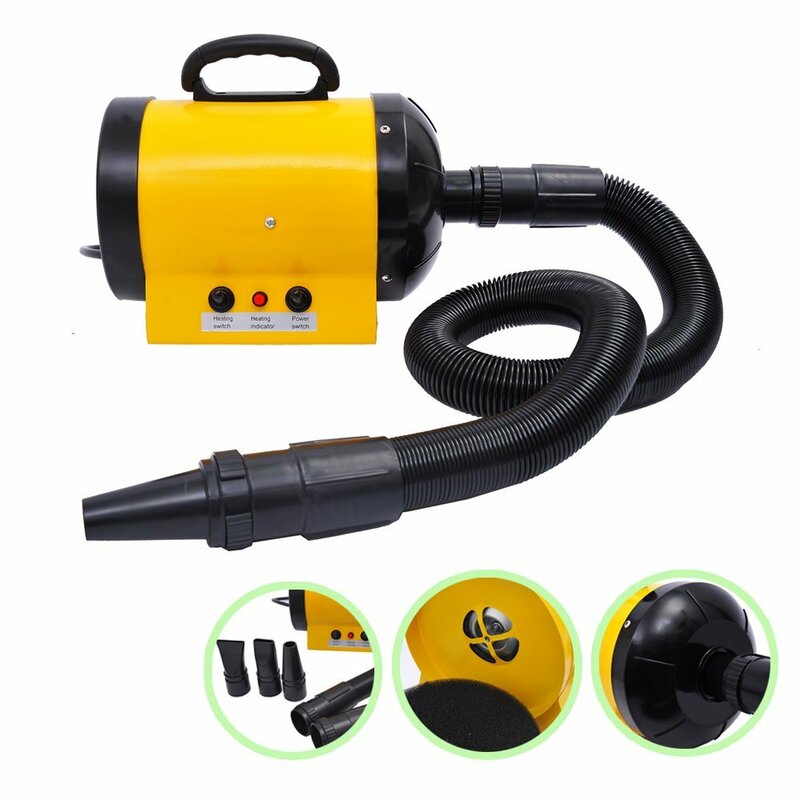 This is an excellent all-round dryer at a very reasonable price. I think this would be my number one recommendation because the price is low, yet the construction and features are to a very high standard. 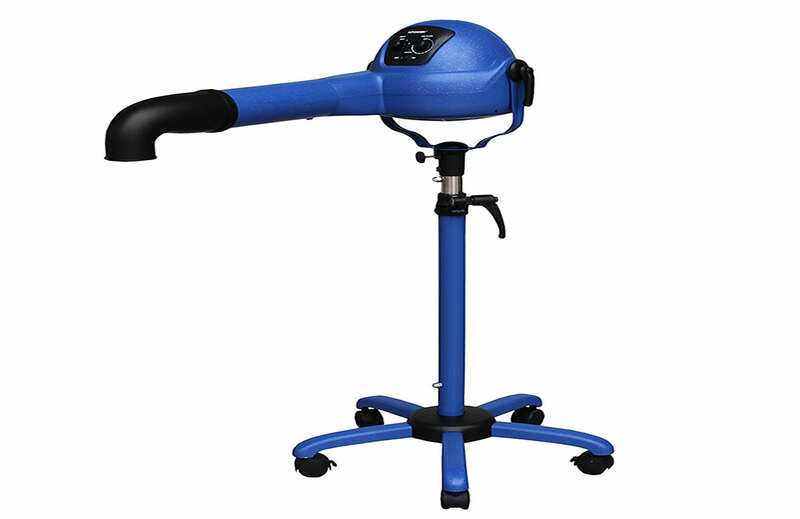 It has the standard 2-speed and 2-temperature versatility for customized grooming sessions. This model has a removable, washable filter which is a big plus, as not many models have this feature. Being able to wash the filter is great for the general upkeep of the machine. The design of this dryer has been very well thought-out. Thanks to the dual mounted legs you can use the machine vertically or horizontally. The temperature of the air is warm but not hot: great for sensitive dog coats and skin.Some people have commented that this model is very loud, while some people have found the noise to be just fine, so it all depends on you and your dog. This is a very light model, weighing in at just over 3 pounds, so it’s ideal for those looking for a dryer they don’t need a forklift to carry from storage to grooming space. The power isn’t as forceful as other models, but it’s certainly sufficient for smaller, less densely-coated dogs. One commenter on Amazon mentioned they use it on Angora rabbits, which is a good demonstration of how gentle it can be, if necessary. This model does not have a heating mechanism, it draws in room temperature air instead, which is a safe option if you want to avoid anything that heats up. I would recommend this one if you have small dogs like Pomeranians or terriers, but not for thick-coated, large dogs. These dryers look like regular hair dryers for humans, but are designed and marketed for dogs. While not as powerful or effective as the high velocity dryers these are great for hands-on grooming and drying. You can give the dog a quick dry by directing the dryer directly to the desired spot. Of course, they don’t take up as much room as the high-velocity, motor-and-hose models, so are great for small or limited storage situations. This is a super affordable hand held dryer with a powerful motor. The temperature can be changed at the touch of a button, and there are 3 different heat settings, as well as a cool-down option. Some users have noted that the highest heat setting is too hot for dogs. Not sure why the manufacturer would set the maximum temperature so high but just be aware of that, and stick to the lower settings. The stand is adjustable, so you can direct the airflow where you like, whilst keeping your hands free to brush and groom your pet. This would be great for those on a tight budget who want a sturdy dryer to get the job done quickly, without the bulk. Stand dryers do what the name suggests…the dryer is mounted up on a stand, so the dog can stand beneath the dryer. These are great for professional groomers as the dog can be situated on a grooming table, with the dryer aimed above. This dryer is ideal for professional groomers – the price-point is high for domestic use, (unless you are very serious about your dog-drying procedures!). The 5-foot stand is great for placing above dogs on tables, and can be moved around easily on the wheeled feet. The construction is sturdy and resilient, made with very strong ABS plastic. The dryer can be cleaned and maintained very easily, which ensures a long life and consistent use. 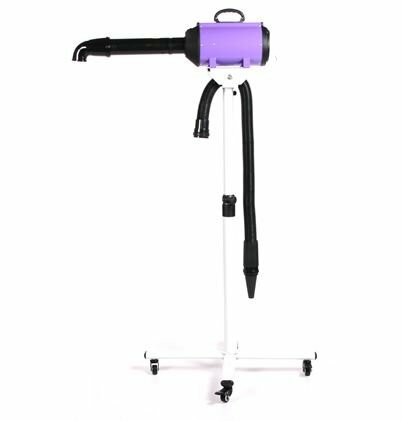 This model offers the best of both words, as it can be used as a hands-free stand dryer, or, the hose can be attached for a more thorough, hands-on drying session. There are 2 choices for heat, wind speed and power which is great if you have more than 1 dog, you are a professional groomer, or you simply want the choice to alter the drying factors according to your dog’s needs at the time. 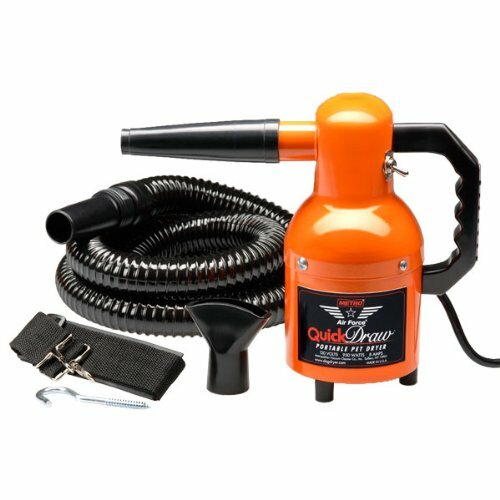 I would recommend this for those looking for a decent stand dryer but don’t want to shell out for the more expensive models. – What kind of fur does your dog have? Is it thick and multi-layered, or is it more flowy and easier to penetrate? Before your purchase a dog dryer, set your budget, then research the models out there that fit into your price range. Make sure the construction is sturdy, with a durable hose and strong casing around the motor, to avoid annoying breakages. If your dog is small and delicate, I would choose a lighter-strength dryer with a low temperature. 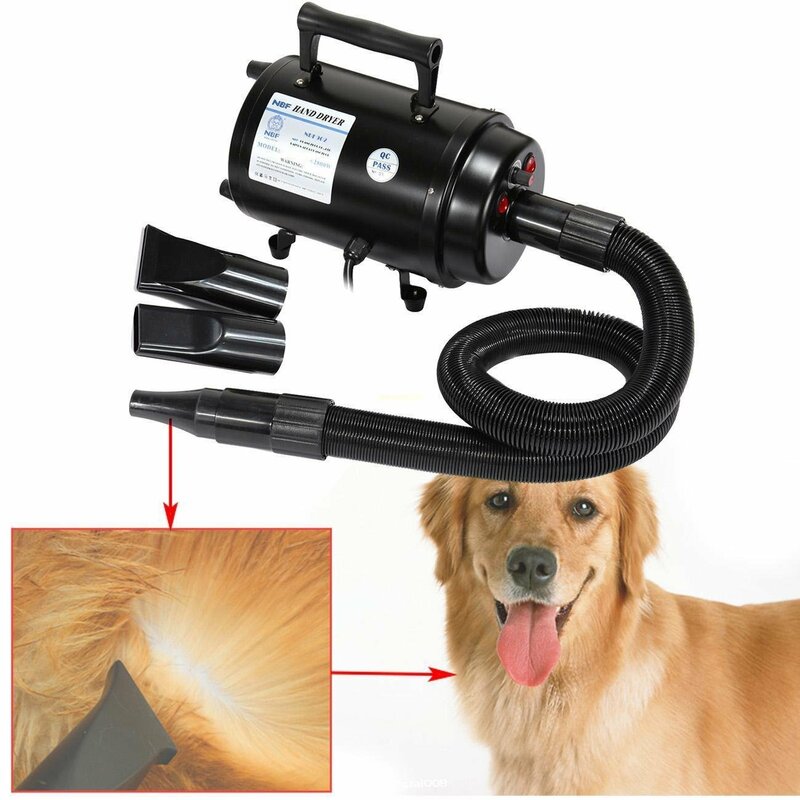 If you have a large, double-coated dog, then one of the high-velocity dryers with a long hose would be the best choice, and there are some very affordable options.